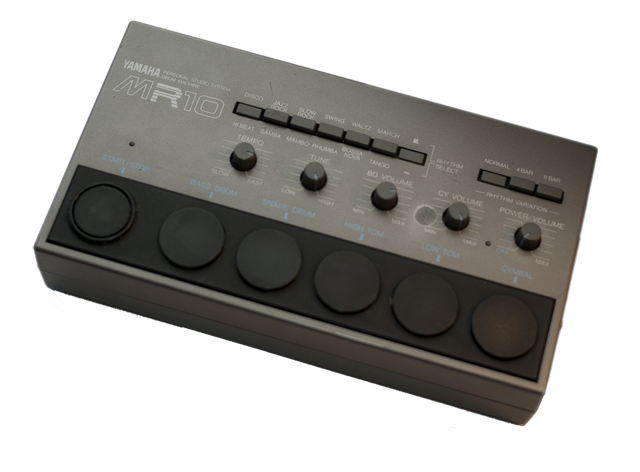 The Yamaha MR-10 analogue drum machine – reborn! If only it had been programmable… Well, of course, now it is. We’ve sampled the original sounds from the front panel pads, plus some sounds that only appear in the built-in rhythms: conga, guiro and a second snare sound that in many ways is more useable than the front-panel one. Each of these sounds has been multi-sampled through the whole travel of the MR10’s “Tune” control. The control isn’t a simple pitch-shift, and seems to have a much more marked effect on the higher frequency sounds like the crash and hats than it does on the kick. It’s a very characterful control, and you have instant access to it on a per-sample basis from the Kontakt front panel (in the original, of course, it affected all sounds simultaneously). We’ve split the original two tom sounds into three, so you have high, mid and low toms available from your keyboard or grid editor. We’ve also added rear-panel controls for panning each individual sound, so although the front panel has “grouped” level controls for toms and percussion, the individual high, mid and low toms, plus the conga and guiro percussion sounds, can all be panned individually from the rear panel. A “velocity retrofit” switch in the bottom right-hand corner lets you use keyboard velocity to control the Tune control rather than setting it from the front panel. This can make the usually robotic drum machine sound way more humanised: the harder you hit the keys (or the higher you draw in that velocity curve!) the brighter and more up-tuned the sounds become. Applied sparingly to hat patterns, for example, this can really make the difference between “mechanical” and “grooving”. So you can either be authentically 80s and have a robotically static setup of sounds, or you can inject some human variety into the sounds with your own playing style. Finally, there’s some useful processing control in there to: a bit-crusher for lo-fi grunge (just leave it all the way up for full 24-bit quality); tube saturation and full-on drive distortion; and a buss compressor to glue everything together. Push this all the way up and you’re into serious pumping territory. With Tube set to 12 o’clock and Comp to around 3pm, the kick on this thing is a joy to behold. 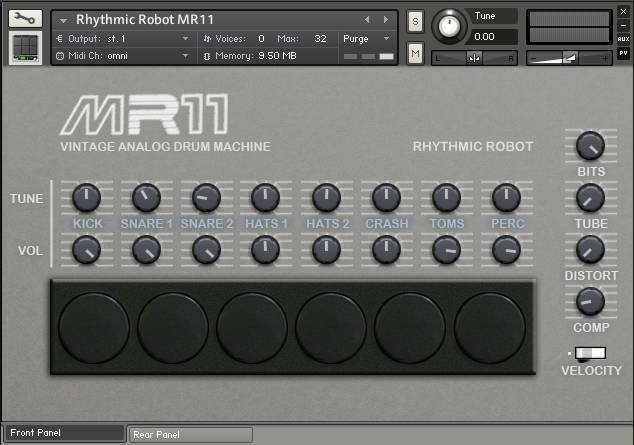 The MR11… one better than the MR10! REALL LOVE THIS!!!! goes hand in hand with my ORIGINAL MR10! If I could give this kit 6 stars I would. For whatever reason, of all the kits, this (well, and that Polish one with all the dated rhythms) instantly rose to the top of my initial RR kit wish list. there is something magical about this kit. Hearing in in action in Bitwig, I am even more convinced. The kick drum is some eldritch conjuration from the depths of vintage bliss. And Velocity does something truly magical to these sounds. Even when you try to hit the key with the same level of press as before, you get this incredible spectrum of sounds. While I will report that I have no idea what the VOL knob is supposed to do across any hit I struck, the sheer variety possible through the use of the other knobs (BITS! TUBE! DISTORT! COMP!) combined with velocity make of this an outrageously organic-seeming little monster. I can’t wait to yoke half of these to Bitwig’s randomizers and let my velocities free on all the rest. Sweet lord, but for more of this. 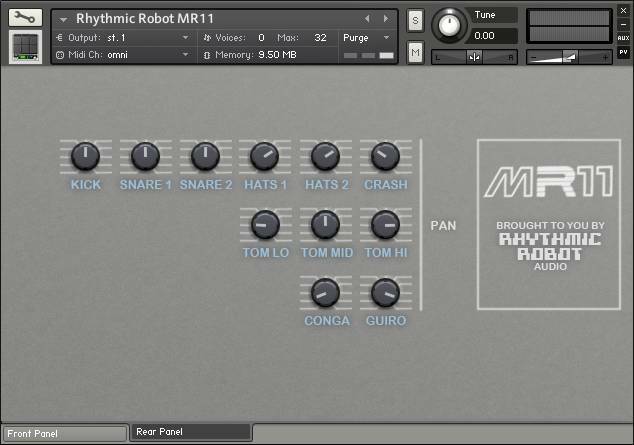 Yamaha MR-10 analogue drum machine is reborn by Rhythmic Robot!! A dirty-fat little drum machine with BIG sound!!! Sounds incredible for the price that it costs, a must-have! I’ve got an original MR10 and I use MR11 in conjunction with it to add to it’s functionality!! LOVE this Kontakt instrument! Thankyou! the price on this is rediculous!powerful drum machine sounds, that will find a place in any electronic music production.just wonderful! This dirty little drum machine is my go to drum machine at the moment and I’ve been using it heavily since getting it. Great value. Oh Yes. This is my favourite. It does that ‘broken speaker’ Aphex Twin-ish bass drum thing really well. Somehow more gratifying and grubby than the MR10 in Arturia’s Spark, and yours for minimal coin.